Life's a Beach, and then you dive. Click here to play! Or something like that. Who doesn't love playing on the beach? The salty sea breeze smells, the hotties of all genders, the fun of tropical cocktails and the relief of beach umbrellas. All great, right? Of course, there are also jellyfish, annoying sea gulls and always the burning countenance of the fiery sun to ruin your day. If only you could have the best of the beach without the worst of it! Well, there's good news and great news. The good news is you can have the best of beach without the worst in the Life's a Beach slots. The great news is that this is an even better option than the beach because you can win a massive jackpot! 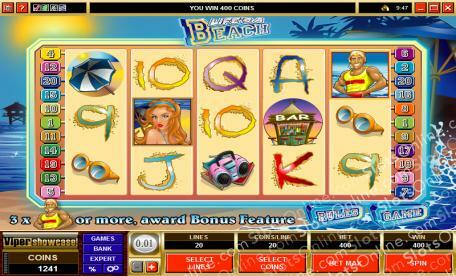 Enjoy a day at the beach whenever you like without having to leave your home in the Life's a Beach 5-reel bonus slots. The Lifeguard symbol is the scatter, and it pays out on the total bet when 2 or more land on the reels. It also triggers the bonus when 3 or more land on the reels. The Beach Babe symbol is wild. It appears only on reels 2, 3 and 4, and can substitute for any symbol other than the scatter symbol. 3 or more Lifeguard symbols trigger the bonus. In the bonus game, the player must choose 4 of 6 umbrellas. A random prize is awarded if the umbrella reveals a bikini babe, while a prize of twice the triggering bet is awarded if a selection does not reveal a bikini babe.